On July 27, 2012, the 30th Summer Olympiad opened in London. Thousands of the best athletes from almost 200 countries are competing against one another in friendly competition for two weeks. Billions around the world have tuned in to watch the sporting events. Few people, however, tune in to the competition going on outside their own window. For a frog, winning the 100 meter dash to a hiding place isn’t a gold medal win. It’s a win for survival. As many athletes mention, there is no second place, unless the belly of a bird counts. 1) Longest jump – The longest recorded jump by a frog (not to be confused with the human frog jump!) was completed by a frog called Santjie at a South African frog derby. The frog, of unknown species, jumped an astounding 33 feet, 5.5 inches. In the United States, the record holder at the famous Calaveras County Jumping Frog Jubilee is Rosie the Ribeter (American bullfrog, Rana catesbeiana), who jumped 21 feet, 5.75 inches in 1986. According to the rules, the leaps were the total measure of three jumps. 2) Weightlifting – Some of the largest athletes at the Olympics are the weightlifters. With the top weight class clocking in at more than 230 pounds and able to lift twice that, these competitors have some massive muscles. The largest frog, and by proxy probably the strongest, is the goliath frog (Conraua goliath). This behemoth, found in a narrow range of Equitorial Guinea and Cameroon, clocks in at 1 foot long and more than 7 pounds! They are listed as endangered by the IUCN because of overharvesting for frog legs. 3) Wrestling – While the single largest individuals at the Olympics have often been wrestlers, the champions of the frog world are much, much smaller. Many frogs will tustle over territory during mating season, but the tiny members of the family Dendrobatidae are the best known for it. You can watch a fantastic clip of a 30-minute wrestling match from David Attenborough’s Life in Cold Blood on YouTube. The frogs rumble and tumble for up to half and hour, with the winner keeping the prime territory and the adoration of the ladies. 4) Gymnastics – It wouldn’t be the Summer Olympics without high-flying gymnastics! In the frog world, this title would most likely belong to the flying frogs, which have independently evolved in three different genera. The most famous and one of the largest is Wallace’s flying frog (Rhacophorus nigropalmatus). All flying frogs have large, webbed feet and skin flaps that allow them to glide from the treetops to escape predators, catch food or head to the ground for mating. I’d like to see them go up against the USA’s Fab Five. Wouldn’t that be a match to see? Though there are many other frogs out there, I hear the closing ceremonies beginning. Unless that bird catches up, see you again in four more years! The real purpose of leap day may be to keep the calendar aligned with the seasons, but here at the rescue project, we’d like to believe the day is designed to honor our favorite leapers. To celebrate, we’ve put together some fun facts about frog leaping. Not all frogs can leap, or even hop. The desert rain frog (Breviceps macrops) has legs that are too short to hop. Instead, it walks. Male frogs of the genus Pipa are known to defend their territory by jumping at and then wrestling other males. The New Guinea bush frog (Asterophrys turpicola) takes jump attacks one step further: before it jumps at a strange frog, it inflates itself and shows off its blue tongue. 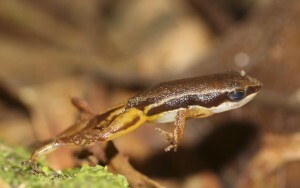 Stumpffia tridactyla are normally slow-moving critters, but when they’re startled they can abruptly jump up to 8 inches. That doesn’t sound very far, but these little guys are less than half an inch long! The Guinness Book of World Records doesn’t include any frogs for their leaping ability. But it does track human performance in frog jumping (jumping while holding one’s toes). There are records listed for the longest frog jump and the fastest frog jumping over 10 and 100 meters. 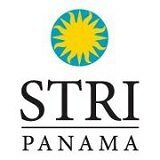 In honor of leap day celebrations being coordinated globally by Amphibian Ark, the Panama Amphibian Rescue and Conservation Project made this video for a frog song written by Alex Culbreth. With Thanksgiving just past and Christmas around the corner, this is a time of year many people turn toward family. While frogs are not the most social of animals and certainly do not celebrate the holidays, they do have a wide range of ways to care for their young. The vast majority of frogs and toads reproduce by laying eggs in streams, ponds, vernal pools, or any other body of water they can find in the spring. The American bullfrog (Rana catesbeiana) and spring peeper (Pseudacris crucifer) are two common examples native to the United States. In both species, males stake out territories on the edge of a pond and call loudly to attract females. Once they mate, the eggs are laid in or near the water. After this, mom and dad are basically out of the picture. However, these tadpoles are perfectly capable of taking care of themselves. In some species, they gather in large groups, oftentimes with siblings. Amazingly, even in this mostly hands-off approach to parenting, family still comes first! Now, we can head to some of the more dedicated parents of the amphibian world. First up is a species of poison dart frog well known for their attentiveness to their children, the strawberry poison frog (Oophaga pumilio). This little frog is common in the rainforests of Central America, from Nicaragua to Panama. 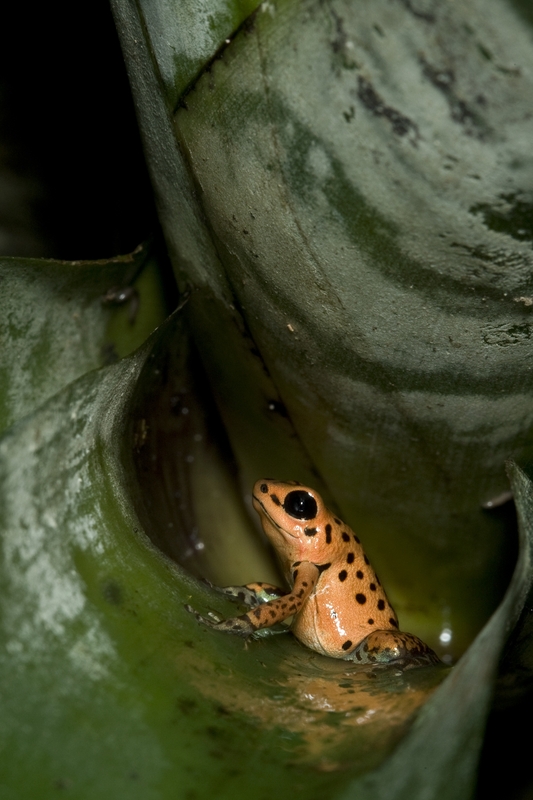 The eggs of the strawberry poison frog are not laid in the water so the males take up the duty of carrying water in their cloaca to keep the clutch of eggs moist. These dedicated fathers can even move around to take care of multiple clutches at the same time! After one to two weeks, the eggs hatch and the female takes over care. She spreads out the tadpoles between small pools of water in bromeliads by carrying them on her back, giving each one its own pool. Finally, she will continue to care for the tadpoles by feeding them unfertilized eggs until they are large enough to begin metamorphosis. Luckily, the strawberry poison frog is listed as a species of least concern by the IUCN because of its large and widespread population. It cannot be said that all male frogs abandon their babies before they are adults. Darwin’s frog (Rhinoderma darwinii) is almost unique in the extraordinary effort males put into caring for their young. After the eggs are laid and fertilized, the male stays around to guard the eggs. A few days before they hatch, he gulps them down into his vocal sac, where they will grow and develop all the way into adults. There are special glands in the male’s vocal sac that secrete food for up to 19 tadpoles that he may be carrying. Once they are old enough, the young hop out of dad’s mouth to start life on their own. Darwin’s frog is currently listed as vulnerable by the IUCN due to habitat destruction in its native country of Chile. As you can see, not all frogs take the hands-off approach our native species do in the United States. Some frogs are very dedicated parents. This season at dinner, ask yourself (or your family! ): Are we really so different from frogs?